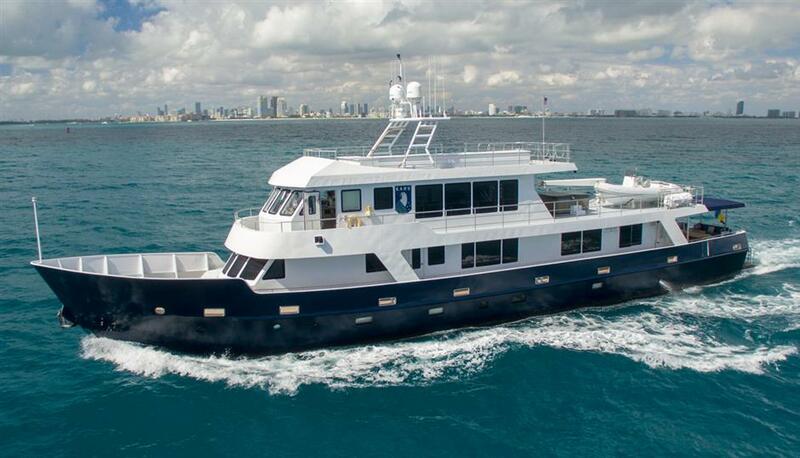 Explore the world aboard this 122 Expedition Yacht : Atlantic Yacht & Ship, Inc. Looking for Adventure? Why not explore the world aboard this 122 Expedition Yacht? The motor yacht “Kahu” was originally built as a New Zealand Navy vessel by Whangarei Engineering & Construction Ltd. After serving her country as an exploration and salvage vessel, she was decommissioned in 2009. At that point, a family with sites on exploring the world purchased the vessel. Then, Fitzroy Yachts in New Plymouth, NZ lengthened and re-purposed Kahu as a long range expedition yacht. Kahu is a very versatile yacht. For example, her 8’ draft allows her to safely access shallow areas. At the same time, she is heavily constructed of steel plate and framing to meet light ice class conditions. The current owner has Logged thousands of miles on Kahu, from Trans-Pacific crossings to trips through the Bahamas. This 122 Expedition Yacht is ideal for many purposes. For example: Oceanographic Research, Light Ice Excursion, Amazon River excursion, Treasure Salvage, At Sea Classroom for University, Shadow Support Yacht, Mothership for Sport Fishing/Diving Program. There are 5 Owner Guest Staterooms plus a convertible study, office, and Crew Cabin. On one hand, Kahu has all the comforts of home and on the other hand, she’s built to battle some of the toughest seas. Where will this 122 Expedition Yacht take you? For more details, contact Central Agents Bryan Carter or Joe Marino. Kahu is conveniently located in Ft. Lauderdale, FL.